Days like today make me a little nostalgic. It has been cold and foggy outside ever since I woke up this morning in San Francisco. Even though it has been like this a lot this summer, for some reason, today it made me think of my first few visits here. The first time was when I was little and I don’t remember much. 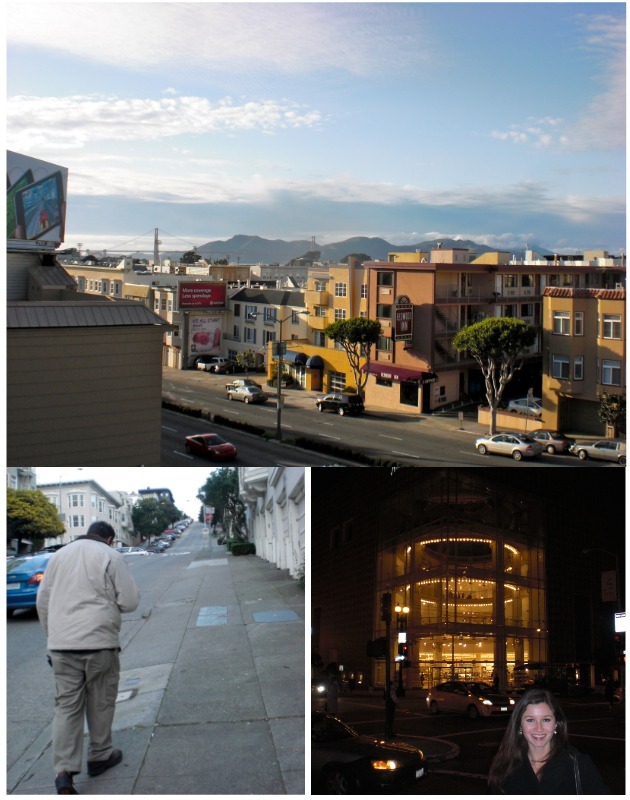 The second time I came up with Fabi for a vacation, and the third I drove up with my dad, who accompanied me to my pharmacy school interview and we had fun exploring the city. We were especially impressed with the large hill we had to walk to get to the cable car, the nice view from out hotel room of the bridge, and of course, the SHOPPING! Both the second and third time I came to San Francisco, I spent time eating at the same Italian restaurant (it was that good). Whenever I go there, I always order the bruschetta. What is so special about it? Well, first of all it has chopped artichoke hearts in it, and second, it is completely overloaded! The first time I tried it, I thought it was impossible to eat without a fork. Now, I have mastered eating it without one! It is really easy to make at home, and is a great snack or appetizer. Don’t be afraid…you will love it! Place the sliced bread onto a baking sheet. Add the remaining ingredients to a mixing bowl and mix together well over 1 minute. You can prepare ahead of time so the flavors become richer! Add salt and pepper to taste and mix well. Use a tablespoon to transfer the mixture on to the baguette slices - about 2-3 tablespoons per slice of bread. Bake for 15 minutes, until the bread is crisp. Remove from the oven and top with addition Parmesan cheese just before serving warm. 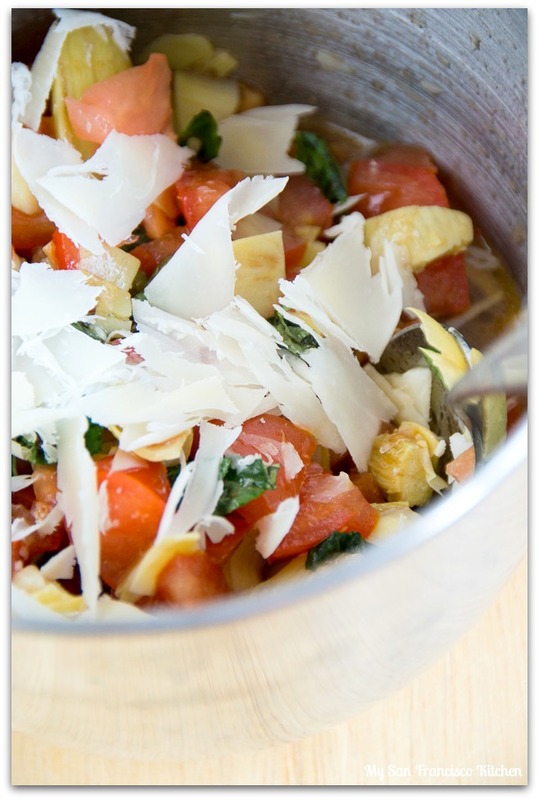 This entry was posted in Appetizers, Bread, Italian, Snack, Uncategorized, Vegetarian and tagged artichokes, basil, Parmesan, tomatoes. I’m pretty positive that I would LOVE this! I’m a huge fan of artichokes. 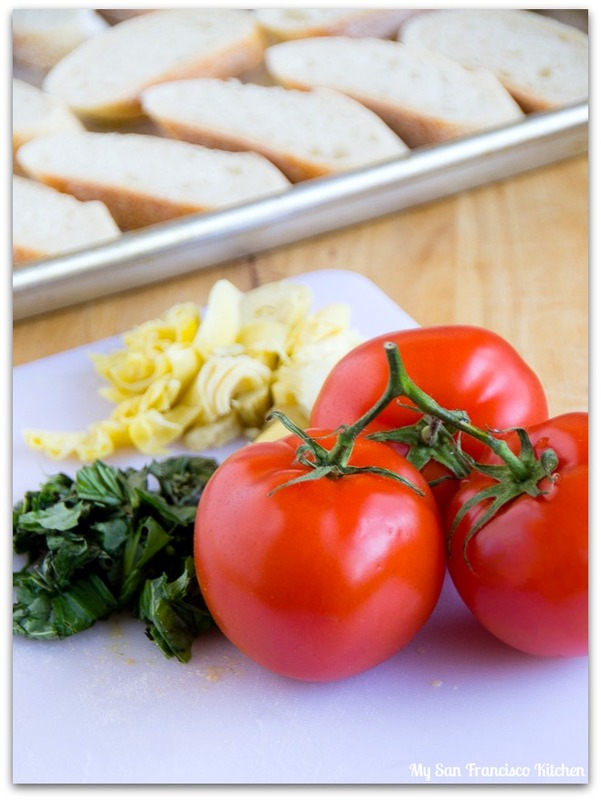 This would make a great recipe when having little get-togethers. Pinning! This looks amazing, adore the addition of artichoke hearts! 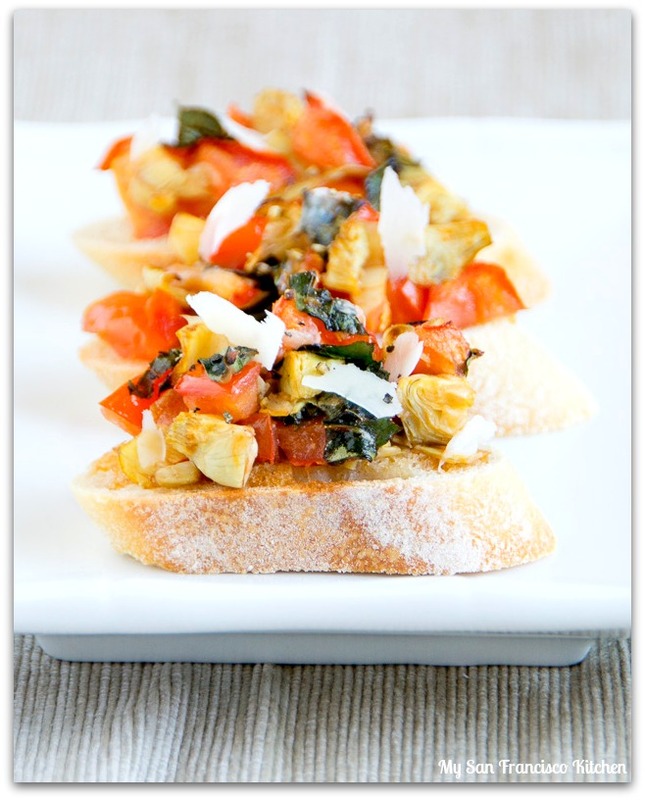 Bruschetta is the best! I love the addition of the artichoke hearts! 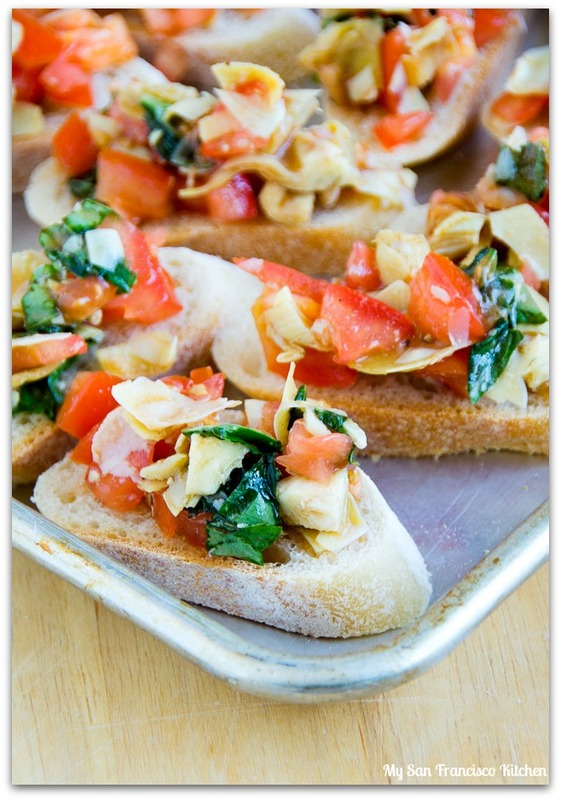 I adore artichoke hearts…so why have I never added them to bruschetta! I could eat a heck of a lot of these delicious babies! I’ve never met an artichoke that I didn’t like! 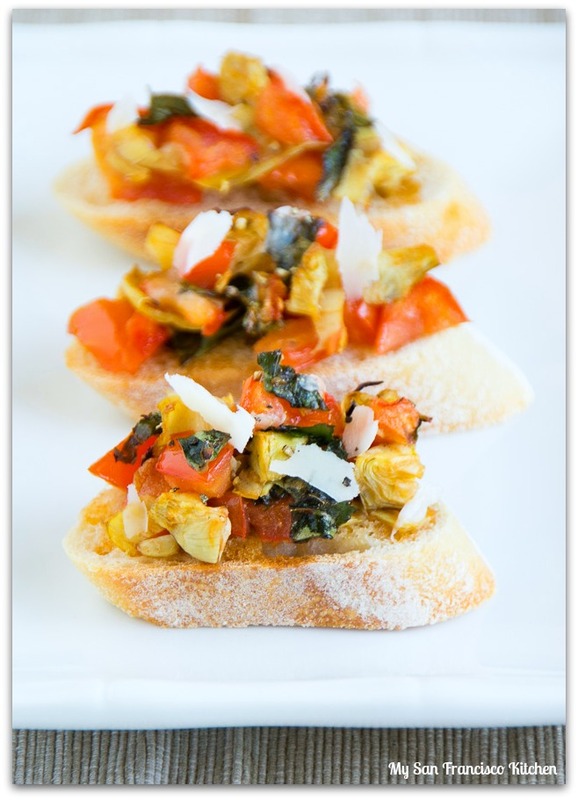 Love the idea of using the hearts as a bruschetta topping. I’m sooo trying this! Thanks.